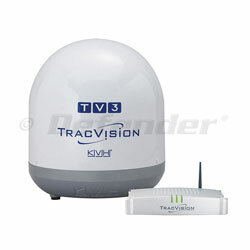 Get up to $2000 with the purchase of a qualifying TracVision Satellite TV system. This item is eligible for a $250 rebate. See rebate form for full details. Offer ends June 30, 2019. The TracVision TV3 with its single-cable design, compact 37 cm (14.5 inch) antenna, and device-friendly user interface, is a snap to install, set up, and use. The DVB-S2 compatible TracVision TV3 is the perfect solution for single- or multiple-receiver installations. In no time, you'll be enjoying your favorite television programming, right from your boat. Complement your KVH TracVision satellite television system with a KVH TracPhone V-IP satellite communications system for fast and reliable satellite Internet and VoIP services. TracPhone V3-IP, V7-IP, and V11-IP are designed exclusively for KVH's mini-VSAT Broadband network, the world's no. 1 maritime VSAT service.